As you know, ECA loves collaborations with kids! We recently received an email from Jenna Clark, youth advocate for Helping Hands 4 Kids, who thanked us for our “With Your Grandchildren” section of our website. She wanted us to know that it’s been a big help in their youth program, the purpose of which is to educate children on environmental issues and teach proper recycling methods. They wanted to give back to us by recommending Oberk.com the kids found filled with information, games and crafts on recycling. Jenna wants to show the children that ECA has added the resource to our list and to acknowledge that they are helping the members of Elders Climate Action to live a greener lifestyle. They will know they contributed positively to the environment. They wish all to have a happier and greener planet! We thank you, Jenna, for your work with youth and for reaching out to ECA! 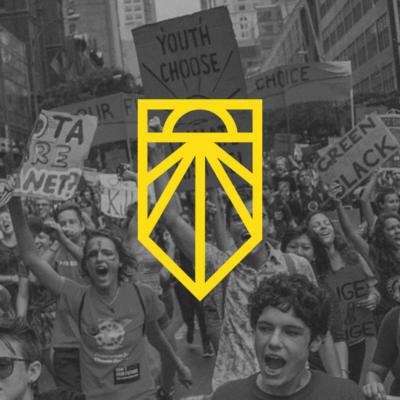 “We’re building an army of young people to make climate change an urgent priority across America, end the corrupting influence of fossil fuel executives on our politics, and elect leaders who stand up for the health and wellbeing of all people. Since 2013, NextGen America has worked to prevent damage to our climate by transitioning to a clean energy economy, based on equality, inclusion, and a shared and sustainable prosperity. Last year, NextGen America stepped up to fight for immigrant rights, affordable health care, and equality for all. In 2018, they’ve taken it even further, registering and turning out young voters at an unprecedented rate in eleven states across the country — to help elect leaders that work for us. iMatter’s mission is to befriend and support young people as they collectively step into their authentic voice and power to disrupt the status quo and push local leaders to do what is necessary to end the climate crisis and transition to a just, sustainable society. Throughout the journey, in every project and campaign, iMatter has always been true intergenerational collaboration, with young people driving the vision and the ideas and adults supporting. And that’s what’s at iMatter’s core today: a group of amazing humans who all embrace and support young people in our authentic power to transform the world. Our Children’s Trust elevates the voice of youth to secure the legal right to a stable climate and healthy atmosphere for the benefit of all present and future generations. Through our programs, youth participate in advocacy, public education and civic engagement to ensure the viability of all natural systems in accordance with science. Enjoy a interactive recycling guide. Nico is on a quest to help save the planet! He’s passionate about sharing his knowledge of recycling with everyone, so join Nico on his journey to reduce, reuse and recycle with tips and fun activities. Once you have the practices down, you can share your recycling knowledge with your family and friends too! 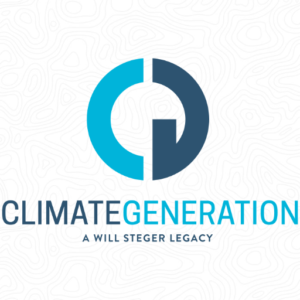 Climate Generation: A Will Steger Legacy empowers individuals and their communities to engage in solutions to climate change. Climate Generation understands that climate change is a highly complex issue and that just and equitable solutions cannot be found if we proceed with the climate science and policy lens alone. We must take a comprehensive perspective of climate change impacts and solutions if we are to reach our goal and create the future we want to live in. We are committed to addressing the intersection of climate change and economic, social, and racial disparities, and working closely with partners who understand this interface. Alliance for Climate Education’s mission is to educate young people on the science of climate change and empower them to take action. By empowering youth to take action within a frame of justice and optimism, we are growing and strengthening the climate movement, and shifting the national discourse on climate in ways that are proven to affect public opinion and policy. The National Renewable Energy Laboratory has developed a teachers’ guide for children in grades K-3 on energy and its impact on the environment. Don’t be discouraged if you are not a teacher. The guide has worksheets that are printable or can be used with your grandchildren on a computer screen. The worksheets will be able to spark a conversation with young children about energy and the environment. The guide can be found here. Created by Delaney Reynolds is a website with fun, engaging, educational materials for kids. 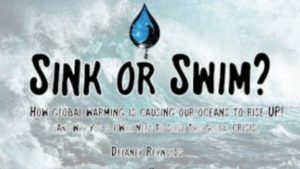 The website by this 16-year-old student from Miami highlights sea level rise with information suitable for children in elementary through high school. Websitewith downloadable coloring sheets for the younger set and games and puzzles for older kids. Check it out and sit down with a youngster and play some climate change games. 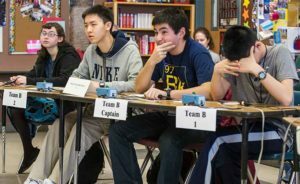 and here is a fun way to spend that time while learning more about climate and climate change. 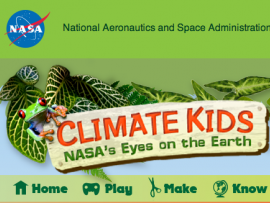 NASA’s Climate Kids website brings the exciting science of climate change and sustainability to life. From games to videos this website has something for every kid. For all of you teachers there are teaching resources on climate issues. is an engaging website created by WGBH in Boston with support by the TED Community. It is a site designed for kids looking after the planet. With games, downloads, and videos, you will find something fun to share with your grandchildren. This multigenerational family includes Granny, Mom and Dad, their daughter and the cat. 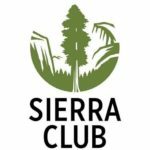 The Sierra Club has a newsletter for kids who want to make the world a better place. You can subscribe or get the electronic version here. Learn about Energy Star Kids! 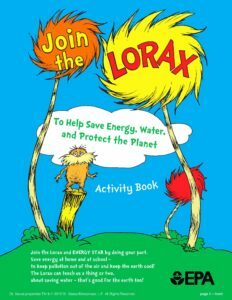 Join the Lorax to learn more about saving energy, water and protecting the planet! 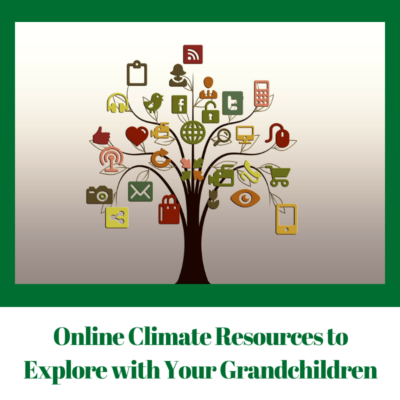 Access lots of great videos and teaching tools to use with your grandchildren to teach them how to save energy in an entertaining way. Check it out!